Specific foods can induce cutaneous reactions, including allergies that involve an abnormal immunologic reaction to food proteins or food intolerance which is not immunological in nature. The aim of this study was to evaluate whether food sensitivity is associated with cutaneous reactions, and evaluate the diagnostic value of the Alcat Test in food sensitivity. 35 patients (22 females, 13 males, median age 41.5 yrs) affected by cutaneous reactions, such as urticaria, angioedema, itching and dermatitis consequent to food ingestion were tested by the Alcat Test. Patients also answered a survey regarding a tailored (diet based on Alcat Test results) 2 month elimination diet. Clinical evaluation was also performed considering the symptom score before and after the diet (0-10), everyday conditioning (0-10), dietary changes (0-10), improvement symptoms after diet (1=nothing; 2=mild; 3=very important). The Alcat Test electronically measures volumetric shifts in blood cells following incubation with food antigens. The degree of reactivity was determined by comparing a baseline distribution curve against the distribution curve generated by the analysis of each test agent/blood sample and calculating the absolute differences between curves and the standard deviation (SD). Any reactivity under 2 SD was considered non-reactive and these foods were allowed in diet. Quantitative parameters were reported as medians (md) and 1st-3rd quartiles (IQR). The Wilcoxon and the Kruskal-Wallis test were performed. A p-value?0.05 was considered statistically significant. 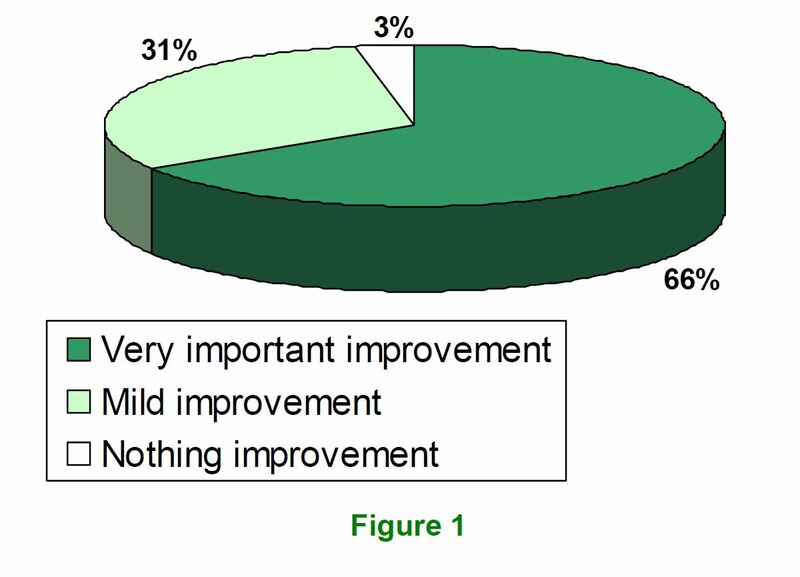 66% of patients exhibited a very important improvement in symptoms, 31% mild improvement and 3% no change (Figure 1). 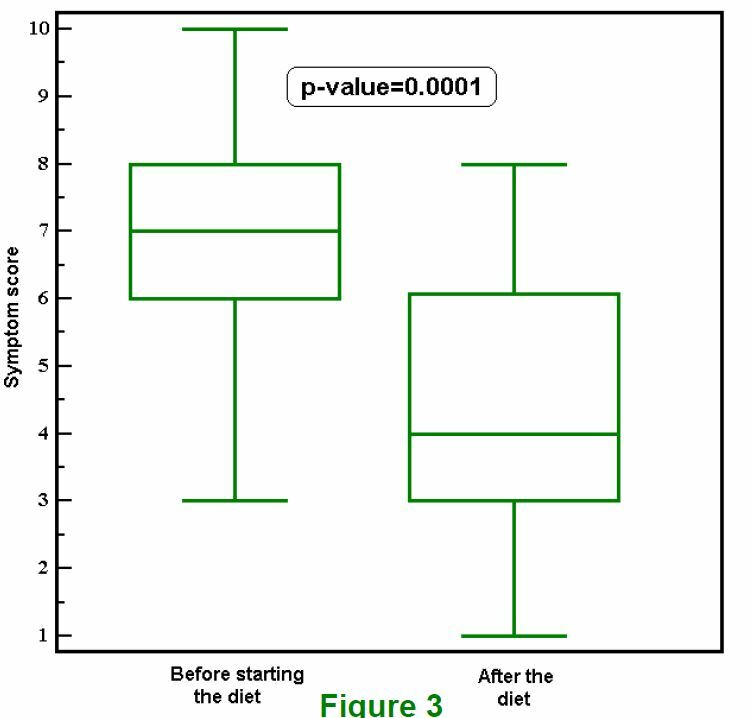 The symptom score before diet changed among improvements symptoms score, but the difference was not significant (p=0.07). 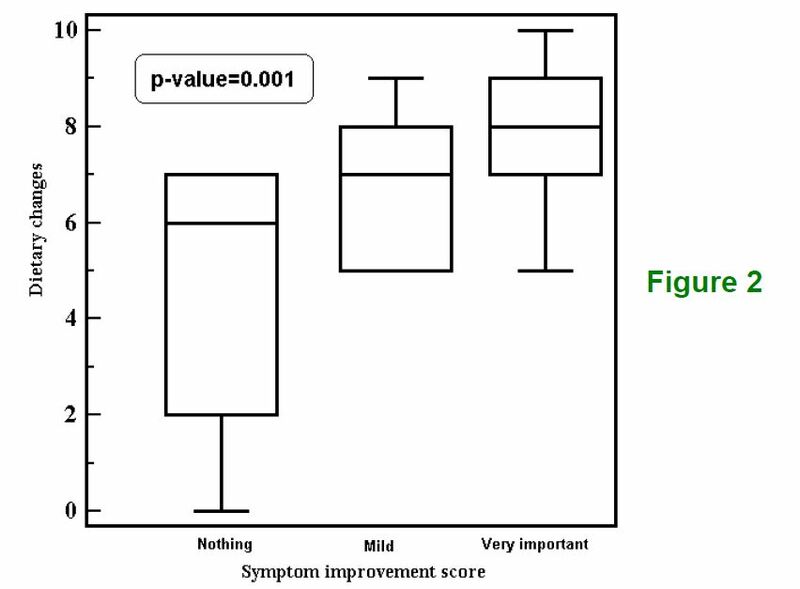 Moreover, dietary changes significantly changed (p=0.001, Figure 2) among improvements symptoms score; in particular, higher values of dietary changes were associated with large improvements. Finally, difference between symptom score before (md:7; IQR:6-8) and after diet (md:4; IQR:3-6) was significant (p=0.0001, Figure 3). The study provides evidence that an elimination diet based on Alcat Test results improves symptoms in 66% of patients. Mild improvements should be considered the result of patient subjectivity (placebo effect) and the benefits resulting from proper nutrition. In conclusion, we demonstrate the beneficial role of Alcat Test.